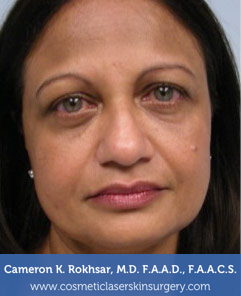 Dr. Rokhsar was among the first in the NYC/LI area to offer the Ultherapy® procedure for lifting and toning loose, lax skin – without surgery! We use tried and true ultrasound to strengthen your skin from the inside out, in a completely non-invasive way. 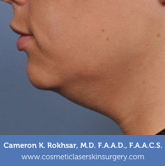 Dr. Rokhsar was among the first physician in the world to offer Ulthera for skin tightening and has been involved in multiple research projects on the subject. After just one to two treatments, with no downtime, your skin will gradually reflect a more refreshed, uplifting appearance. This is the result of a high degree of control and consistency not previously seen with other tissue tightening devices. While many areas of the face can be treated, one of the most popular areas includes the brows, which can cause eyes to appear smaller as loose skin descends. Ultherapy lifts the brow, reducing excess skin on the lids and opens up eyes to provide a refreshed and younger appearance. Unlike other non-surgical procedures, Ultherapy is able to treat not only the skin itself, but the deep foundation below the skin that is typically addressed in cosmetic surgery. This initiates your body’s collagen rebuilding process without disturbing the surface of your skin. How? The Ultherary system’s ultrasound energy (DeepSEE) allows Dr. Rokhsar to see the layers of targeted soft tissue and then treat them with unprecedented prescribed precision. 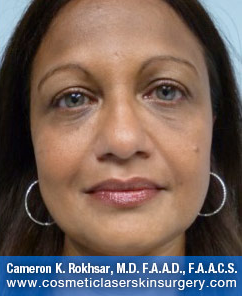 Dr. Cameron Rokhsar is an experienced cosmetic surgeon whose New York Ultherapy patients are often thrilled with their results. Dr. Rokhsar has been doing Ulthera since 2009, longer than any other physician in the New York area. He has published research articles on the use of Ulthera on skin tightening on the skin of various parts of the body. Treatment involves gentle heat to the tissue to lift and tighten loose skin without cutting tissues. Aside from lifting and tightening, Ultherapy also stimulates new collagen production, which assists in maintaining a youthful appearance. Within an hour, your body’s own healing responses will be signaled to gently and gradually restore skin and underlying tissue. Best of all, Ultherapy requires no preparation or recuperation! Lifting usually takes place primarily over the first two to three months. Patients can immediately return to normal activities, though skin may appear flushed or patients can experience swelling, tingling or tenderness which is mild and temporary. Ultherapy has been featured in Harper’s Bazaar, Vogue, Marie Claire, The Rachel Ray Show, The Doctors, Elle Magazine, The View, More Magazine, Good Morning America Health, and many other news and media outlets. As a non invasive procedure, Ultherapy is a great way to get results without needing to undergo surgery (and all the recovery time associated with that). 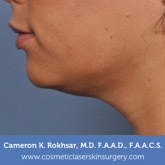 Procedures such as facelifts of neck lifts can require weeks before swelling recedes. However, Ultherapy recovery is relatively speedy. In most cases, patients experience only an hour of slight redness as the extent of any “recovery” needed. Patients can almost always return to normal activities immediately after their procedure. As a premiere Ultherapy provider, Dr. Rokhsar offers Ultherapy treatments at his practices in Long Island and in New York. Results from Ultherapy sessions appear months later as it takes time for new collagen production. Most patients notice a tightening of the skin, which translates into fewer lines and wrinkles and a more youthful overall look. Considering patients are able to achieve this look without surgery, the ultrasonic technology of Ultherapy provides great skin-tightening results. Not only does provide more options for patients who aren’t ready to go under the knife, Ultherapy’s results are gradual and often more natural looking. After just one to two treatments, your skin will often shift back into a more youthful position. If you are interested in learning more, please contact us today to schedule an appointment! To learn more about Ultherapy Brow Lift, please visit the page here. How is the Ultherapy procedure different than other cosmetic procedures? Ultherapy utilizes ultrasound technology in order to specifically target and strengthen the deep tissue layers that plastic surgeons address in surgery. After two treatments, a gradually improved and refreshed appearance provides the patient with youthful skin. The progressive results are typically achieved within 2 to 3 months. Results May Vary. Who is an ideal candidate for Ultherapy treatments? Those who want a more youthful appearance and want to achieve it with no downtime will find Ultherapy treatments ideal for their cosmetic goals. The most popular areas are the brows, eyes and droopy skin, also known as jowls.